In the late 1930s the DM&IR was in need of new locomotives that would be able to handle 115-car, 8750-ton trains over .62% grades without stalling. The Western Pacific 2-8-8-2 was used as a basis for their design. The larger cab required a longer and heavier frame. Therefore, a 4-wheel trailing truck was used. Roller bearings were used on all locomotive and tender axles. The DM&IR was the only road who chose to use "pedestal" or "centipede" tenders with their Yellowstones. THE DM&IR Yellowstones also had gray boiler jacketing. DM&IR was pleased with the first batch (class M-3) of 8 received from Baldwin in 1941 so they ordered 10 duplicates (class M-4). They were completed late in 1943 after much of DM&IR's traffic had subsided, so some of the M-4s were leased by and delivered directly to the Denver & Rio Grande Western. The following winter the D&RGW again borrowed the 2-8-8-4s for use as helpers over the 10,239-foot Tennessee Pass crossing of the continental Divide. The D&RGW sent a telegram to the DM&IR stating that the Yellowstones were the finest steam locomotives to ever operate on its road. On the DM&IR they were used as the main road power to pull ore trains throughout the Duluth area. For the most part, ore trains had to be pulled downhill to the ore docks on Lake Superior in Duluth and Two Harbors. These trips did not require the enormous pulling force of the Yellowstones. Surprisingly, the limiting factor (as far as what the iron range locomotives could pull) was the 2.2 percent grade from Duluth up to the yards in Proctor. The ore cars had to be returned empty to these yards for sorting. The Yellowstones were sometimes used to pull empties up this hill from Duluth to Proctor. However, the classic 'hill' power was the older modified 2-8-8-2 'Hill' engines with their extra air tanks on top of the boiler. 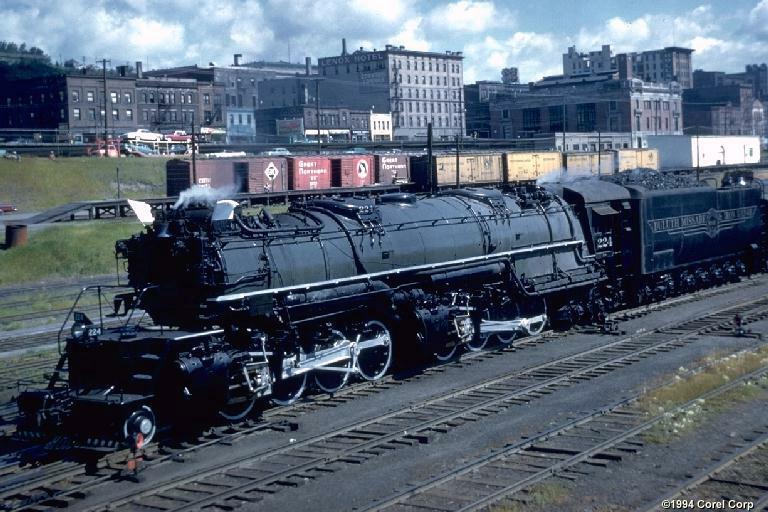 Newer 2-10-4s and 0-10-2s were also used on the 'Hill' at least in the mid-late 50's when steam was still on the line. Someone once told me that he spoke to a couple people (including the diesel shop foreman who used to fire the Yellowstones and a former engineer on the Yellowstones) at the Proctor roundhouse while 227 was being restored in preparation for its display in the museum in Duluth. They said that it was possible to empty the tender of almost all coal and water of a Yellowstone while pulling a load of empty ore cars up the hill from Duluth to Proctor. This is to say: 25,000 gallons water and 25-26 tons of coal! This is hard to believe and perhaps it is a bit of an exaggeration, but it does show that this was one of the more difficult tasks for the Yellowstones. All of the DM&IR Yellowstones were all retired between 1958 and 1963 except for 237 which was sold for scrap after a wreck. Fortunately, three survive today. Data from tables and diagrams in 1947 Locomotive Cyclopedia and from DM&IR 6 - 1951 Locomotive Diagrams supplied in May 2005 by Allen Stanley from his extensive Rail Data Exchange. (Thanks to Chris Hohl for correcting valve gear ID.) Works numbers were 62526-62533 in May 1941; 64707-64711 in January 1943 and 64712-64716 in February. These classic engines were based to a large extent on the Western Pacific's M-137-151 2-8-8-2 engines of 1931 (Locobase 332), but were lengthened to take an all-weather cab . The DM & IR engines burned bituminous coal and had a smaller grate area than the oil-burning M-137s although the overall firebox heating surface grew by 11 sq ft (1 sq m). In the M-4, this total included 194 sq ft (18 sq m) in three thermic syphons, 177 sq ft (16.45 sq m) in the combustion chamber, and 32 sq ft (3 sq m) of arch tubes. As part of the M-137 revision, the combustion chamber's length grew from 6 to 7 feet (2,134 mm). Boiler tube and flue length (sheet to sheet) was shortened by 2 feet to 21 feet (6.4 m). The mixture of tubes and flues changed as the design substituted a Type E superheater for the M-137's Type A. The number of 2 1/4-in flues decreased to 82 and Baldwin installed 245 of the 3 3/4-in flues (vs. the M-137's 270 of the former and 75 5 1/2-in flues) . As a result, superheater area increased by 25%. The first five M-4s had Worthington feedwater heaters, the last five Elescos. Four piston valves each measured 12" (306 mm) in diameter. Following contemporary practice, the M-3s had integrally cast frames and cylinders, Timken roller bearings on all driving axles, ASF (M-3) or SKF (M-4) roller bearings on all truck axles. These engines performed very well from the time they entered service in May 1941, soon handling train loads 25% heavier than the earlier M-1/M-2 engines could manage. The last ten engines were M-4s, built by Baldwin in 1943, which used carbon steel in certain components because of a shortage of high-tech alloy steels. They had an engine weight of 699,700 lb (317,379 kg). During 1943-44, as many as 12 "Yellowstones" were operating on the D & RGW, the GN, and the NP under lease where they were highly regarded. In fact, the D & RGW telegraphed the DM&IR with the claim that these Yellowstones were the finest engines ever to run on the Rio Grande. 225 is on display in Proctor, MN and carries the tender originally from 236. In 1995, 225 had all of the boiler jacketing removed giving it a "white" appearance. This will probably extend its life on display as moisture will no longer be trapped against the boiler. Since then 225 had been painted and is looking pretty nice. After retirement, 227 was stored in the Proctor roundhouse. 227 carries the tender originally from 231. In 1967, 227 is put on display at the Lake Superior Railroad Museum. Today, her driving wheels are supported slightly above the railheads. An electric motor is used to spin her wheels slowly so that you can see the motion of the massive valve gear. Of the three surviving Yellowstones, 227 is probably in the best condition. In 1960, 222 was put on display in Two Harbors after it was retired. However, it remained on display for only a few months. 222 was needed for a DM&IR fan trip and was taken out of retirement and put back into service. Later in 1960, 236 was placed on display to replace 222 which had been put back into service. 236 was later removed from display when it was needed to provide steam for iron ore thawing duties. 221 was put on display to replace 236 which was now thawing iron ore.
221 was displayed until 1967. Apparently, it had deteriorated, and had been vandalized beyond restorability. The decay was so sever that the DM&IR felt it had to be scrapped. It was pulled from Two Harbors to the Proctor roundhouse by an SD9 and later sold for scrap. This was 1967. Even at that late date, a locomotive as awesome as an DM&IR Yellowstone was scrapped! For more details see the November 1976 issue of TRAINS. In June, 1967, 229 was put on display replacing 221. Amazingly, 229 (and the tender from 222) had been stored in the Proctor roundhouse all this time under the direction of the DM&IR president. Years later, when the 222 tender was restored to display status, it was found to have the wheels from tenders #220 and #224.